Minister of Local Government and Community Development, Hon. 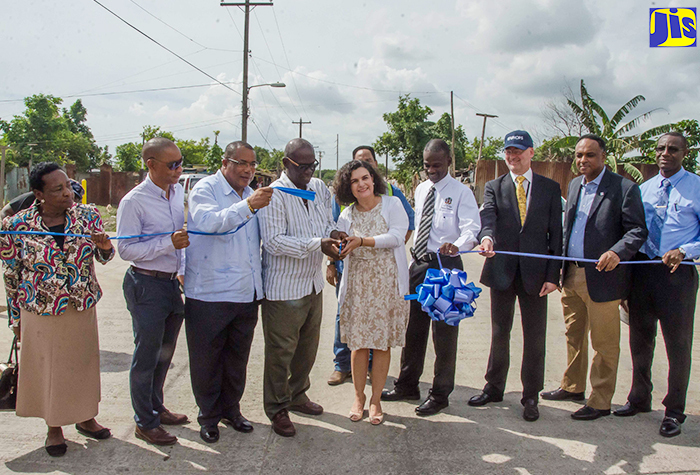 Desmond McKenzie (4th left); and Mexican Ambassador to Jamaica, Her Excellency Cecilia Jaber (centre); cut the ribbon symbolising the official opening of the Riverton City access road in West St. Andrew today (November 14). Others sharing in the moment (from left) are Councillor Candidate, Seaview Gardens Division, Hazel Anderson; Chairman, National Solid Waste Management Authority, Dennis Chung; Member of Parliament, West St. Andrew, Anthony Hylton; Permanent Secretary in the Ministry, Denzil Thorpe; United Nations (UN) Resident Coordinator/United Nations Development Programme (UNDP) Resident Representative, Bruno Pouezat; Managing Director, Jamaica Social Investment Fund (JSIF), Omar Sweeney; and City Engineer, Norman Shand. Access to the Riverton City disposal site in West St. Andrew has significantly improved with the completion of rehabilitation work on the 1.65 kilometres of roadway leading to the area. Undertaken through a US$1.8-million grant from the Mexican Government, the project included the concrete paving of the roadway and installation of a proper drainage. “It is important that the maintenance mechanism of this road be a priority of the NSWMA because we don’t want two or three years down the road to defeat what we are opening,” Minister of Local Government and Community Development, Hon. Desmond McKenzie. The road, which is managed by the National Solid Waste Management Authority (NSWMA), had fallen into disrepair, due to heavy usage by compactor trucks transporting solid waste and other refuse to the landfill, and the effects of weather. The repair work will also improve pedestrian and vehicular access for residents of the area and provide them with relief from the dust and mud they previously experienced. Speaking at the official opening ceremony, Minister of Local Government and Community Development, Hon. Desmond McKenzie said the roadway will have to be regularly maintained. “It is important that the maintenance mechanism of this road be a priority of the NSWMA because we don’t want two or three years down the road to defeat what we are opening,” he said. Mr. McKenzie thanked the Mexican Government for its commitment and support to Jamaica over the years. In the meantime, he said a proper system of garbage collection and disposal needs to be established for the Riverton disposal site. 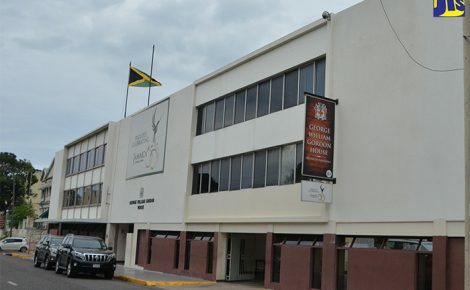 He noted that the Government has appointed a nine-member Enterprise Team, chaired by Lyttleton Shirley, which is charged with managing the process of establishing a waste-to-energy system in Jamaica and the contracting out of the solid-waste collection and solid-waste management of the country. Mexican Ambassador to Jamaica, Her Excellency Cecilia Jaber, said the road project will assist the Government’s efforts to put a more efficient waste-management programme in place. She added that it will also improve the environmental conditions of the area as well as response time by emergency personnel, should the need arise. Community member Dania Crump, expressed gratitude, noting that the rehabilitation of the access road will significantly improve the area. She informed that approximately 250 persons were employed on the project. Other speakers at the ceremony included Member of Parliament for the area, Anthony Hylton; Chairman, NSWMA, Dennis Chung; and United Nations Resident Coordinator/United Nations Development Programme (UNDP) Resident Representative, Bruno Pouezat. The construction project was managed by the United Nations Office for Project Services (UNOPS). Work commenced in September 2015 and was completed within time and budget.